The BabyDan Extra Tall Gate stands 105cm high and fits openings between 90cm and 367cm depending on the size you decide to choose. The Extra tall gate is perfect for the more adventurous toddlers who would try a scale a standard gate, or if you have pets in the house this gate is great. Distance between bars 5.1cm / 2"
Please see the size guide below and choose the closest size that suits your needs. The door section can be placed in the centre, left or right, depending on your preference. The wall mount comes with each purchase. Danish company BabyDan have been creating safety products since the 1950s. Their mission statement remains "Eyes for Safety". 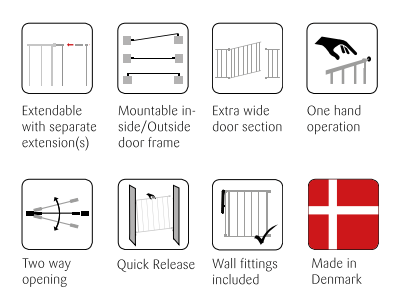 Having researched several baby gates, I came across BabyDan's extra tall safety gate, which immediately suited for our needs. I needed to a baby gate for the top of our stairs, but immediately on the landing there is another step leading off to a hallway. I knew a standard height baby gate would not do the trick as there would have been a risk for children to gain access to it from a higher level. However this extra tall gate has provided the safety I require and I am reassured to let the children run free on the upper levels of the home.